On the 19th (Fri), spend an adventurous day with a kayaking and canoeing tour. There's lots more to do: explore the activities along Kabira Bay, take an in-depth tour of Ishigaki Yaima Village, stroll around Kabira Park, and enjoy breathtaking views from Tamatorizaki Observatory. To see reviews, maps, photos, and more tourist information, read our Ishigaki online sightseeing planner . Bengaluru, India to Ishigaki is an approximately 15.5-hour flight. The time zone difference when traveling from Bengaluru to Ishigaki is 3 hours. Expect slightly colder weather when traveling from Bengaluru in April: highs in Ishigaki hover around 30°C, while lows dip to 24°C. Finish your sightseeing early on the 21st (Sun) so you can travel to Nagasaki. When in Nagasaki, make a side trip to see Huis Ten Bosch in Sasebo, approximately 1h 15 min away. Next up on the itinerary: take an in-depth tour of Nagasaki Atomic Bomb Museum, admire the natural beauty at Glover Garden, examine the collection at Dejima, and take your sightseeing to a higher altitude at Mt. Inasa. For more things to do, traveler tips, photos, and other tourist information, go to the Nagasaki trip builder . Traveling by combination of flight and train from Ishigaki to Nagasaki takes 6 hours. Alternatively, you can fly. Plan for slightly colder temperatures traveling from Ishigaki in April, with highs in Nagasaki at 22°C and lows at 14°C. Wrap up your sightseeing on the 24th (Wed) to allow time to take a train to Hiroshima. Explore Hiroshima's surroundings by going to Mt. Misen (in Miyajima) and Hatsukaichi (Itsukushima Shrine, Itsukushima Shrine Torii, & more). There's much more to do: see the interesting displays at Hiroshima Peace Memorial Museum, explore the historical opulence of Hiroshima Castle, appreciate the history behind Atomic Bomb Dome, and contemplate the long history of Hiroshima Peace Memorial Park. To see more things to do, ratings, where to stay, and tourist information, read Hiroshima road trip planner . Getting from Nagasaki to Hiroshima by train takes about 3.5 hours. Other options: drive; or take a bus. April in Hiroshima sees daily highs of 22°C and lows of 13°C at night. Wrap up your sightseeing on the 27th (Sat) early enough to take a train to Himeji. On the 28th (Sun), take in nature's colorful creations at Koko-en Garden, steep yourself in history at Nishi no Maru, make a trip to Nishi no Maru Nagatsubone, then steep yourself in history at Himeji Castle, and finally don't miss a visit to Shoshazan Engyoji. Plan my Himeji trip by asking Inpirock to come up with tips and suggestions. Traveling by train from Hiroshima to Himeji takes an hour. Alternatively, you can drive; or do a combination of bus and train. In April, plan for daily highs up to 20°C, and evening lows to 14°C. Finish up your sightseeing early on the 28th (Sun) so you can catch the train to Kyoto. Step out of Kyoto to go to Osaka and see Universal Studios Japan, which is approximately 1h 15 min away. Next up on the itinerary: contemplate the long history of Kiyomizu-dera Temple, take in the spiritual surroundings of Kinkaku-ji, make a trip to Heian Shrine, and take in the pleasant sights at Arashiyama. To see reviews, maps, and tourist information, use the Kyoto tour planner . Getting from Himeji to Kyoto by train takes about an hour. Other options: drive; or take a bus. In April, daytime highs in Kyoto are 22°C, while nighttime lows are 11°C. Wrap up your sightseeing on the 2nd (Thu) early enough to take a train to Kanazawa. Venture out of the city with trips to Shirakawa-mura (Shirakawago Gassho Zukuri Minkaen, The Historic Villages of Shirakawa-go Gassho Style Houses, & more). There's still lots to do: stroll around Kenrokuen Garden, step into the grandiose world of Kanazawa Castle, see the interesting displays at Ishikawa Prefectural Museum for Traditional Products and Crafts, and make a trip to Seisonkaku Villa. For ratings, photos, traveler tips, and more tourist information, read our Kanazawa attractions planner. You can take a train from Kyoto to Kanazawa in 2.5 hours. Alternatively, you can drive; or take a bus. Traveling from Kyoto in May, expect nights in Kanazawa to be about the same, around 15°C, while days are a bit cooler, around 26°C. 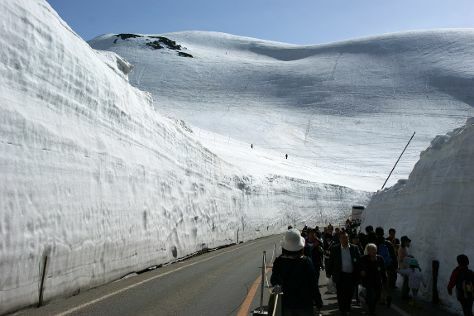 Finish your sightseeing early on the 6th (Mon) so you can drive to Matsumoto. A castle town, Matsumoto possesses one of the best-preserved feudal structures in the country, and maintains its historical attractions and traditions while simultaneously exuding a modern, cosmopolitan charm. Explore the numerous day-trip ideas around Matsumoto: Kirigamine Marshland (in Suwa), Yashimagahara Marsh (in Shimosuwa-machi) and Takayama (Takayama Jinya & Takayama Festival Floats Exhibition Hall). The adventure continues: explore the historical opulence of Matsumoto Castle, get outside with Mt.Takagari, take in the spiritual surroundings of Nishinashinmeigu, and go for a walk through Daiganbo. To see ratings, maps, and more tourist information, read our Matsumoto road trip planner . You can drive from Kanazawa to Matsumoto in 3 hours. Alternatively, you can take a train; or do a combination of bus and train. In May, daytime highs in Matsumoto are 26°C, while nighttime lows are 18°C. Wrap up your sightseeing on the 10th (Fri) early enough to take a train to Tokyo. Have a day of magic on the 14th (Tue) at Tokyo Disneyland. There's lots more to do: take in nature's colorful creations at Shinjuku Gyoen National Garden, take in the spiritual surroundings of Sensō-ji, admire the striking features of Tokyo Tower, and don't miss a visit to Tokyo Metropolitan Government Buildings. To find maps, traveler tips, and other tourist information, go to the Tokyo trip itinerary builder app . Traveling by train from Matsumoto to Tokyo takes 3 hours. Alternatively, you can drive; or take a bus. In May, daytime highs in Tokyo are 28°C, while nighttime lows are 19°C. You'll have a few hours on the 16th (Thu) to wrap things up before traveling home.